With the free-state faction firmly in control, the territorial legislature of 1859 approved a fourth and final constitutional convention, and on June 17, 1859, delegates were elected to gather at Wyandotte on July 5. Thirty-five Republicans and 17 Democrats were chosen to attend the convention. Their average age was 35: the oldest delegate being Robert Graham, 55 years, and youngest B.F. Simpson, 23 years. There were 18 lawyers, 16 farmers, eight merchants, three manufacturers, three physicians, one mechanic, one land agent, one printer, and one surveyor. Following the events of “Bleeding Kansas” and the defeat of the Lecompton Constitution, in July 1859 when the delegates assembled at Wyandotte, the people assumed that Kansas was to be a free state. Both Republicans and Democrats followed the examples set at Topeka and Leavenworth. They quickly inserted a clause prohibiting slavery in the Bill of Rights. 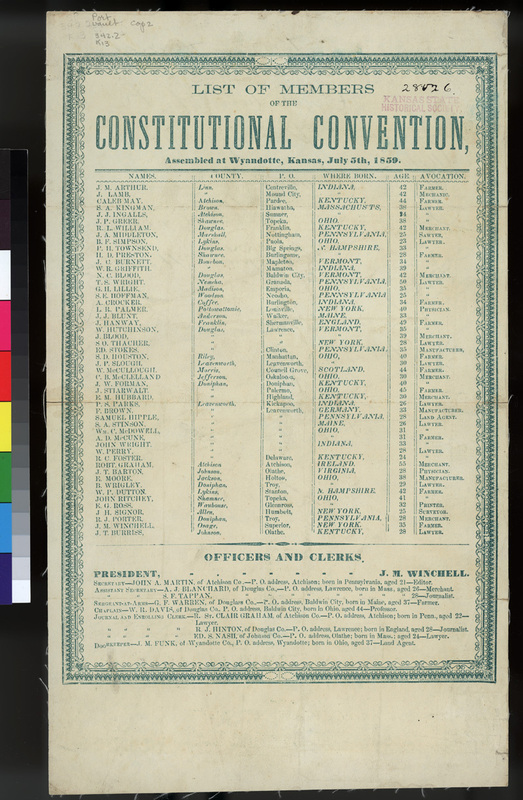 Unfortunately, in the 1850s opposition to slavery seldom meant acceptance of equal rights, and many delegates supported a clause that would have prevented free blacks and mulattoes from entering the new state of Kansas. This effort was defeated and the Kansas Constitution did not contain an "exclusionary clause," but as some predicted the words "white male citizen" were "embodied in the instrument." As delegate James Hanway explained early in the deliberations, this no doubt disappointed Kansas's "friends in the States." But "many delegates will vote for the word 'white' on the ground of policy, believing that the majority of the people of Kansas desire the word to be inserted, and that it would be an act of folly to risk the whole instrument by a failure to do so." The first three constitutions written in Kansas adopted the existing boundary lines for the Kansas Territory. The eastern, southern, and northern borders were the same as they are today. The western border, however, extended as far as the Continental Divide and included the Pikes Peak gold fields. Although not a major issue at earlier assemblies, at Wyandotte the boundary question caused much controversy. Many delegates saw this huge territory as a disadvantage and sought to fix the western border far to the east of the Rockies. Democratic delegates also wanted the state's northern border extended to the Platte River. But Republicans united to defeat this effort "upon grounds that there is strong reason to believe the Administration desire to embarrass our admission into the Union at an early day," reasoned Franklin County delegate James Hanway; "and that should we propose to attach this portion of the territory to our Territory, then an effort would be made to cut off a large slice of our southern boundary, and place us to the Indian Territory on our southern boundary." In the end the old northern border was retained and the western border was fixed at 102 degrees west longitude (the 25th Meridian). Kansas emerged from the convention with its present rectangular shape. There was some support among the male delegates for granting equal voting rights to Kansas women. The majority, however, would not accept this "radical" idea. Thus, suffrage was granted only to "Every white male person, of twenty-one years and upward." By this clause, blacks and Indians also were denied the vote. However, the rights of women were not totally ignored in the final document as they were given property rights over their own possessions, and a legal footing to maintain custody of their children. The Wyandotte Convention did not include Kansas's best-known free-state leaders: Charles Robinson, James H. Lane, Martin F. Conway, Samuel C. Pomeroy, Cyrus K. Holliday, Marcus J. Parrott, and Thomas Ewing, Jr., most notably, perhaps. For whatever reason, Robinson, Lane, and Conway, who was president of the Leavenworth Constitutional Convention, did not enter the field of fourteen candidates vying for Douglas County's seven delegate positions; Pomeroy and Holliday also chose not to run; and Parrott and Ewing entered the Leavenworth County contest, but the Democratic Party carried the field there, capturing all ten delegate positions. Thus, with the possible exception of John J. Ingalls, James G. Blunt, and Edmund G. Ross, most of the delegates' names remain unknown to modern-day Kansans. These 35 delegates were the first to carry the party labels, the Republican Party having been formed in the territory just a few weeks before—and although there was much debate and disagreement, they conducted most of their business with civility. 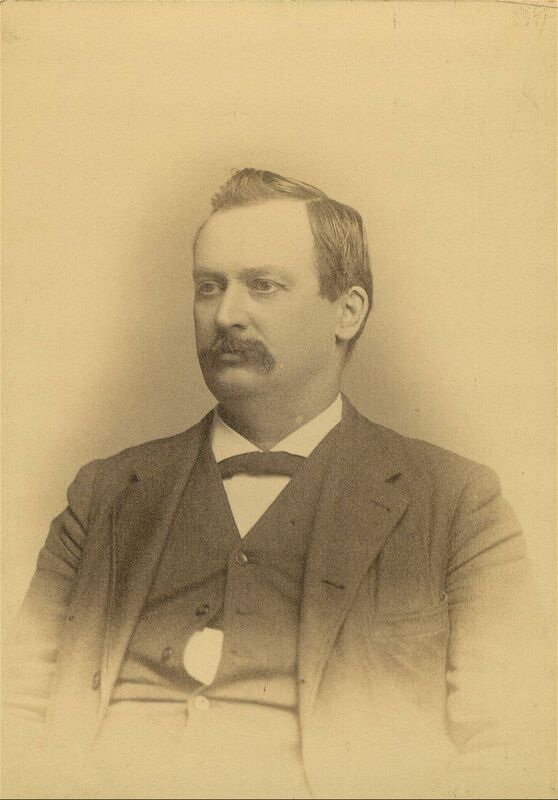 John A. Martin, Atchison, Atchison County, Editor. Although not a delegate and only twenty-one years old, John A. Martin, a future governor of Kansas, was chosen secretary to the convention. Martin was already a respected and successful editor (Freedom's Champion, formerly the Squatter Sovereign) and had helped found the Kansas Republican Party in May 1859. He distinguished himself during his Civil War service, before resuming his journalism career. 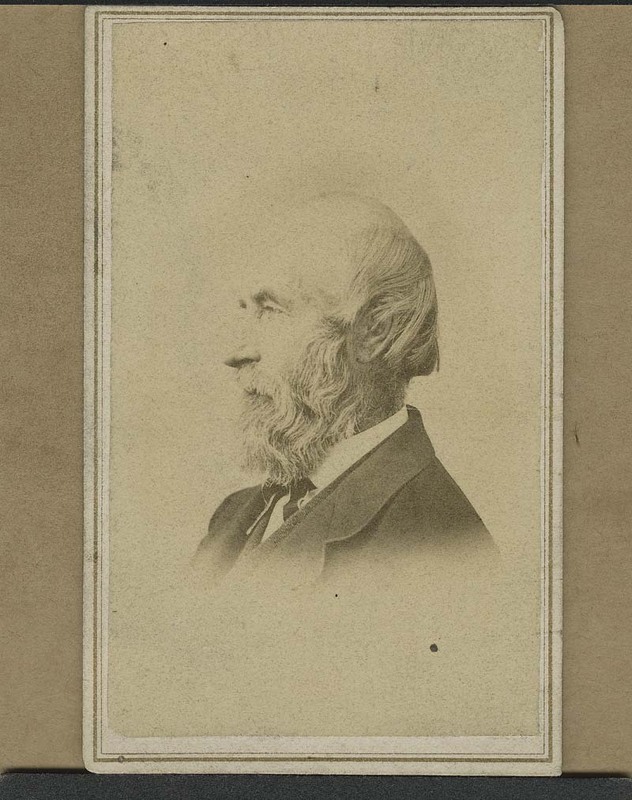 The Atchison editor and veteran was active in the GAR, and in 1875 Martin was among a group of Kansas editors who founded the Kansas State Historical Society. He served as governor of the State of Kansas from 1885-1889 and died in Atchison on October 2, 1889, just eight months after finishing his second term. A. J. Blanchard, Lawrence, Douglas County, Republican, age 26, from Mass. Samuel F. Tappan, Lawrence, Douglas County, Republican, age 28, from Mass. Ed. S Nash, Olathe, Johnson County, Republican, age 24, from Mass. R. St. Clair Graham, Atchison, Atchison County, Republican, age 22, from Pennsylvania. Richard J. Hinton, Lawrence, Douglas County, Republican, age 28, from England. G. F. Warren, Baldwin City, Douglas County, Republican, age 37, from Maine. The convention's sergeant-at-arms was a farmer, born in Maine, who moved to Kansas Territory from New Hampshire in 1854. J. M. Funk, Wyandotte, Wyandotte County, Republican, age 37, from Pennsylvania. The convention's door keeper was a 37-year-old land agent who came to Kansas from his native Pennsylvania in 1856. W. R. Davis, Baldwin City, Douglas County, Republican, age 44, from Ohio. The convention's chaplain was a clergyman and former Whig who moved to Kansas Territory from Illinois in 1858.